Epson XP 630 is a multifunctional printer of Epson’s small-in-one range. The wireless device offers print, scan, and copy functions and produces high-quality prints. It also offers you the ability to print from and scan to a memory card. The printer also offers multiple media handling and can print documents, graphics, images and printable discs. 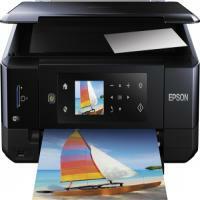 The Epson XP 630 weighs approximately 14.7lbs and measures 15.4 X 134.4 X 5.4 inches. It has a flatbed scanner and three different input trays. At the front bottom, there is a plain paper input tray that can hold up to 100 sheets, a 20-sheet blank photo paper tray, and a CD/DVD tray for disc printing. The printer also has a large touchscreen control panel of 2.7 inches. The printer uses XL Epson XP 630 inks cartridges that last longer and help you save a lot more on printer’s running cost. Epson XP 630 is a compact and small all-in-one printer that fulfils almost all the requirements of home users. The printer boasts many advanced features that make it a useful option for small office users. It solves the limited space issue of home and small office users without compromising the quality of the output. However, the lack of ADF and fax features and limited paper capacity might be a disappointment to office users or professional who deals with massive printing tasks. These Epson XP 630 ink cartridges are also available in 18XL multipack. How to fix a print quality issue in an Epson XP 630 Printer? Is your printer making odd image printouts with weird colour contrast? Or, just missing some colours and have lines on them? These are common issues with an Epson Expression series printer that can occur either due to blocked printhead nozzles or because of the dried out Epson XP 630 ink cartridges. Whichever the cause is, the print quality issue can be resolved by following some easy steps. Blocked print head nozzles can cause colour casting issues. You can check the print head nozzles by using a Nozzle Check utility on your Computer. Performing a nozzle check will determine if any of the nozzles are blocked. Insert an A4 sheet in the input paper tray for the print test. Make sure the sheet is not damaged, old or dirty and the printable side of the sheet is facing up. On your PC, go to the printer driver maintenance and utility section. Then, click on ‘Nozzle Check’. Doing this would prompt the printer to run a print test. It would produce a printout with some predefined line segment. If there are gaps or missing segments in the test lines, then you need to clean the printhead. However, the lines are all fine and clear, then there is no issue with the printhead nozzles and you need to move to the next solution. Sometimes old ink cartridges start getting dry and produce printouts in a low quality. You need to check the purchase date of these Epson XP 630 ink cartridges. If they were bought long ago (longer than 6 months) and haven’t been used on regular basis, it is time to replace those. Q. Being a home user, I used to have an Epson printer. Suddenly the printer started printing blank pages. What can I do now? Is there any fault in my EPSON XP 630 ink cartridges? Please help. An incorrect installation of the cartridge may result in blank pages. A common mistake you could have made is you forgot to remove the protective sheet or the cartridge cover. It is necessary to remove the tap before you install the cartridge into the printer. Make sure that the EPSON XP 630 ink cartridges are not empty. Check the ink level. Epson’s printer produces blank pages when the ink cartridge is empty. Maybe you have not used your Epson printer for a long time. In such conditions, a heavy amount of ink can dry up and clog at the print heads on the cartridge. You need to unclog the print heads of the cartridge. Use another software for your printing job. An outdated printer may also lead to problems while printing. Visit your manufacturer's website and update the printer drivers. Q. Are EPSON XP 630 ink cartridges available in 18XL multipack? A. Yes, these ink cartridges are also available in an 18XL multipack. Q. I’m looking for a printer that supports cloud printing so that I can take printouts wherever needed. Is EPSON XP 630 printer a preferable choice? A. Yes, the printer supports cloud printing and scanning to cloud. One can easily take prints wherever needed. Q. Does the printer support borderless printing? A. Yes, the printer supports borderless printing. Q. Is it possible to take printouts from this printer with wireless connectivity? A. Yes, the printer supports both wireless and USB connectivity. Q. Does Epson XP 630 printer print on card stock? If yes, then how? As, I am looking out to print on 80 lb stock on regular basis. A. Sure, definitely. The printer works well with standard 80 lb stock without any issues. You just need to turn on the ‘thick paper’ setting from the control panel and print through the rear feed slot available. Q. Why my Epson XP 630 printer is unable to recognise the cartridge? A. This can happen when the contacts on the Epson XP 630 Ink Cartridge are not linking up with the printer due to thin film formation of dirt, dust or fingerprints. To resolve the issue, try cleaning the copper contact plate on the cartridge with a damp piece of clean cotton cloth. After wiping it, let the cartridge sit until the copper plate dries up. Next, turn on your printer's cleaning program 2 to 3 times to clean the head and allow the ink through. If still the cartridge is not recognised, remove the cartridge and reinstall it to ensure it is firmly seated. Hope this will resolve your issue. Q. I purchased fresh Epson XP 630 Ink Cartridge online recently. But the print quality with the new cartridge is highly inferior. Is something wrong with my printer or the cartridge? Please explain. Thanks. A. At the outset, if you tried to install the Epson XP 630 Ink Cartridge as soon as it arrived then it's neither the cartridge or the printer to be blamed. As, during shippings the cartridge could get jolted or shaken resulting in formation of air bubbles which hinder the smooth flow of ink. Hence, it is best recommended to store the new cartridge overnight with the print head at the bottom(exactly the way you would place it in your printer). This will allow the ink to settle down at the bottom with air at the top. Besides, automatic print head cleaning function is carried out by the printer whenever new cartridges are installed. So, alternatively if the above given solution doesn't work, please carry out another print head cleaning function through the printer software to ensure the cartridge is ready to use for high quality printing. Q. How many pages would the 33XL black ink cartridges print? you ink volume only has the volume in mls. A. Our compatible Epson 33XL ink volumes are shown in ml the black being 12.2ml and the 33XL cyan, 33XL magenta, 33XL yellow 8.9ml and 33XL photo black being 8.1ml. This equates to the black printing approximately 530 pages @ 5% coverage. Q. I have some Epson T0711 black ink cartridges from a previous Epson printer, can I use them in my Epson XP-630? They seem to be the same size. A. Unfortunately while they may look the same the cartridges are different. The Epson XP630 ink is specifically designed for use in this printer and is only interchangeable with other printers in it's own group. The popular Epson T0711 ink cartridge is not compatible with your printer. Q. I mostly print black and white text on my printer, can I set my printer to print only using black ink? A. The Epson XP630 ink comes in five colours; Epson 33XL black (T3351), Epson 33XL cyan (T3362), Epson 33XL magenta (T3363), Epson 33XL yellow (T3364), Epson 33XL photo black (T3361). The printer will always use a pinch of all colours to print black but you can reduce the amount of colour ink it uses by selecting 'Draft' quality in Microsoft Word. Q. Why these compatible Epson XP 630 ink cartridges are available at much lower cost than the original ones? A. The compatible Epson XP 630 ink cartridges are recycled from the original cartridges. There is no cost included in manufacturing the body parts of these compatible cartridges, which reduces their manufacturing cost and then these cartridges are sold in bulk. Due to these 2 factors the final cost of remanufactured cartridges are much lower. However, even they are recycled products the low cost doesn’t compromise with the print quality of the printouts. Compatible Epson XP 630 ink cartridges are also eco-friendly in nature as they help in preserving the environment. Q. Does Epson XP 630 printer come with a dedicated CD/DVD function, which allows you to print directly onto CD’s/DVD’s? A. Yes, the Epson XP 630 printer comes with CD/DVD tray for disc printing / CD/DVD printing. Q. I recently replaced my printer with Epson XP 630 now that I'm needing ink I purchased from a competitor only to find they were incompatible they replace them with same result, can you guarantee your cartridges. My previous supplier said that Epson put a blocker in some of their printers to stop suppliers copying, can you verify this before I place an order. Q. Which black cartridge is in the Epson 33XL ink pack? Is it the standard XL, or the photo black, or both? A. The Epson 33XL ink pack consists of both, the regular black Epson 33XL ink cartridge and the photo black Epson 33XL ink cartridge as your printer will require both types of ink cartridges to be installed. A. These are very common issues with Epson XP series printers. You can check for the print head nozzles by using a Nozzle check utility on your computer, this will determine if any of the nozzles are blocked. You should also check the purchase date of these Epson XP 630 ink cartridges, as if they were bought long ago they could have started drying and can produce printouts with low quality. Q. Is it necessary to install both regular black and photo black ink cartridges in my Epson XP 630 printer? Can I install anyone of them? A. No, Epson Xp 630 printer should be installed with all five Epson XP 630 ink cartridges (filled) in order for printer to work. Each colour cartridge has to be installed in the specific colour slot available inside the printer. Q. How can I clean my Epson XP 630 printer? A. You should clean your printer several times a year to keep its working at its best. When not in use close the output tray and front cover to protect the printer from dust. To start cleaning process, turn off the product first, unplug all the cables, remove all the papers, clean the scanner with a soft cloth moistened with a little glass cleaner (do not press the scanner glass forcefully), the control panel and the outer case can be cleaned with a soft, dry cloth. Don’t let liquid solution (water, oil, lubricant, etc.) get inside it.